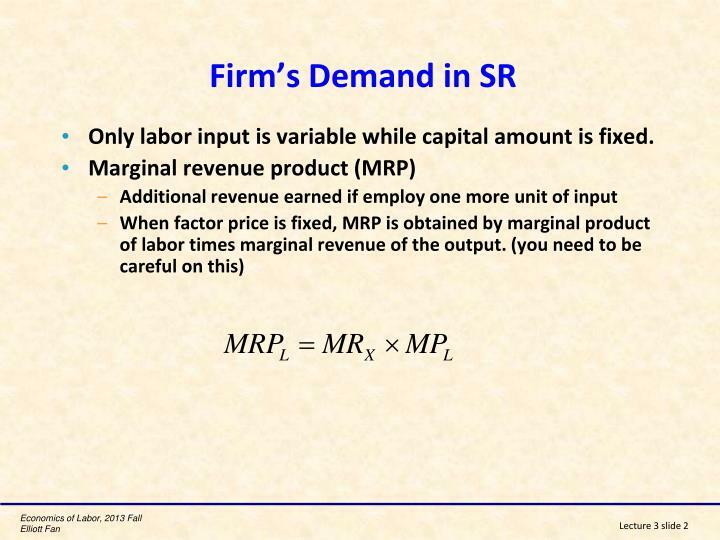 Only labor input is variable while capital amount is fixed. 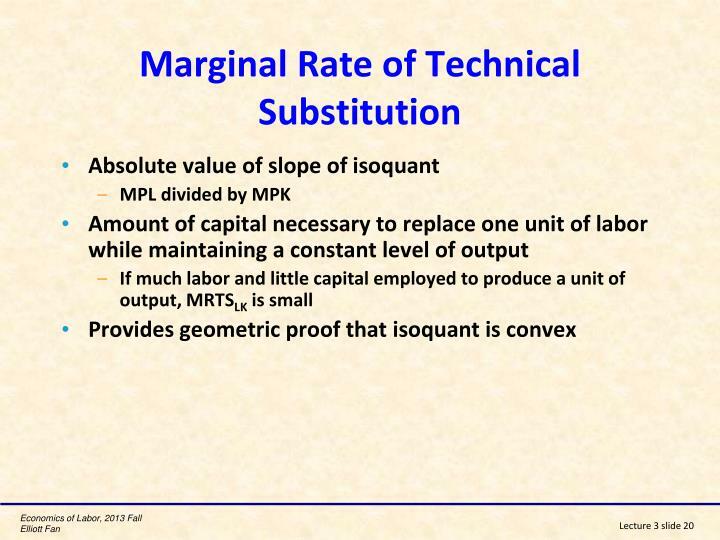 Marginal product of labor is defined as the contribution to output by adding an additional unit of labor. 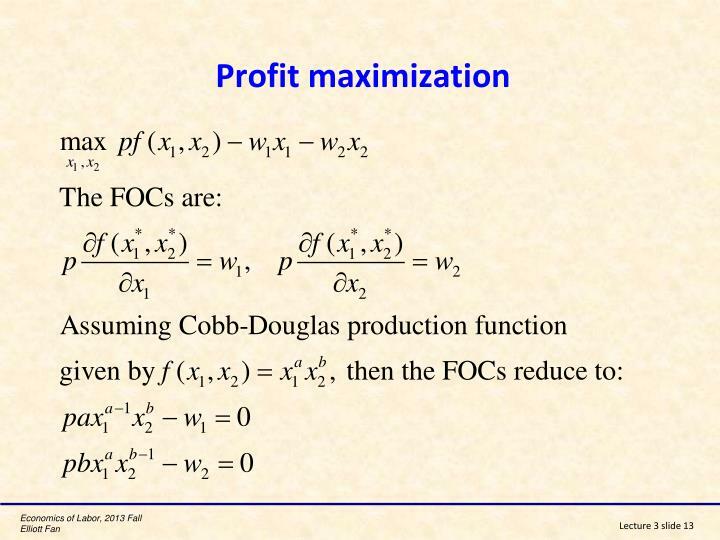 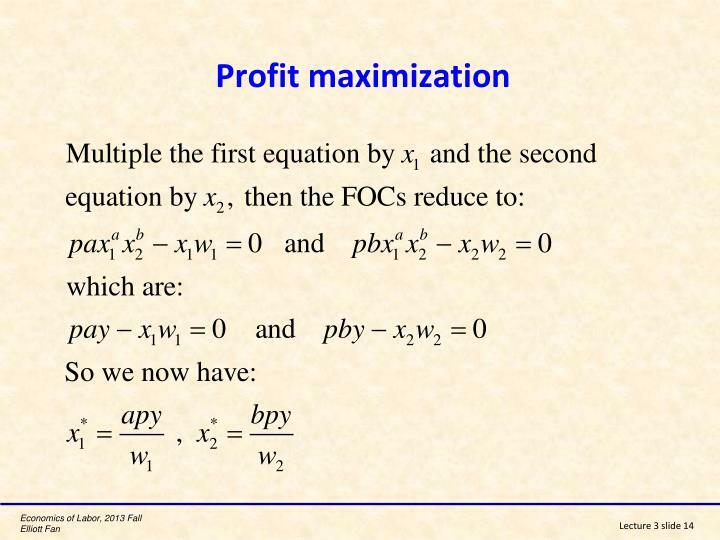 It confirms that a profit-maximizing firm operates where the wage rate of labor is equal to its marginal product of labor. 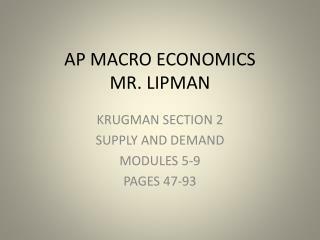 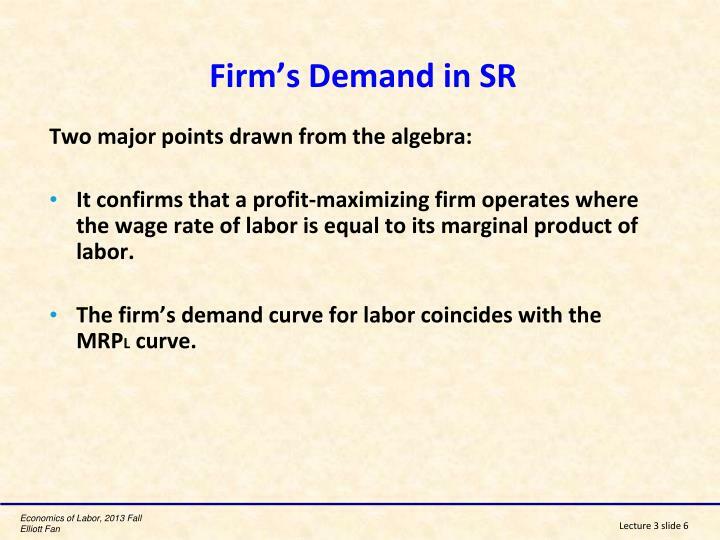 The firm’s demand curve for labor coincides with the MRPL curve. 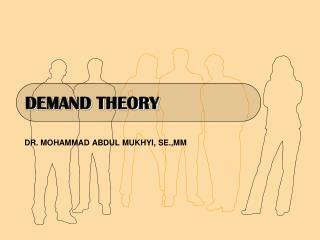 A common criticism is that the theory bears little relation to the way that employers make hiring decisions. 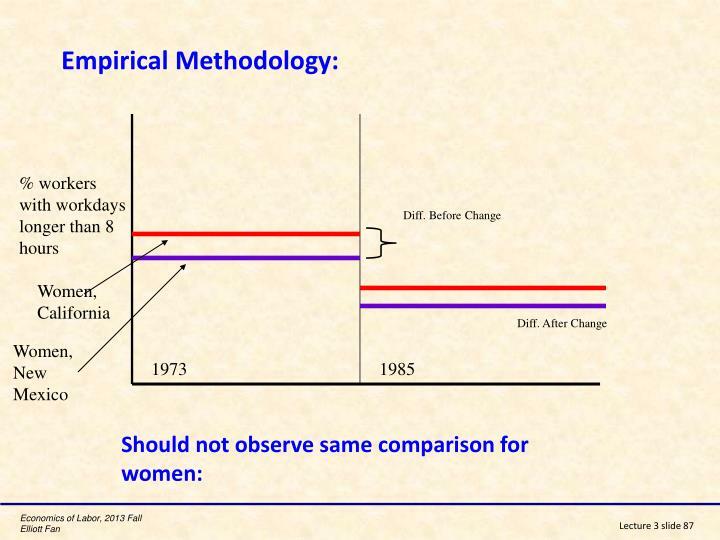 Another criticism is that the assumptions of the theory are not very realistic. 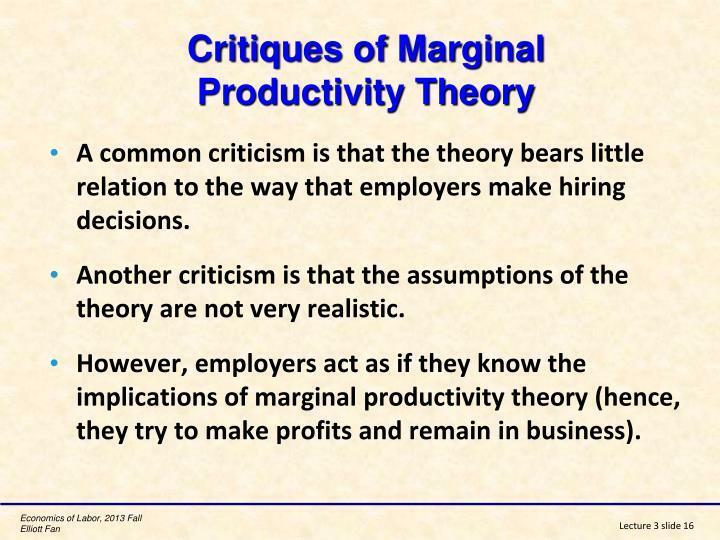 However, employers act as if they know the implications of marginal productivity theory (hence, they try to make profits and remain in business). 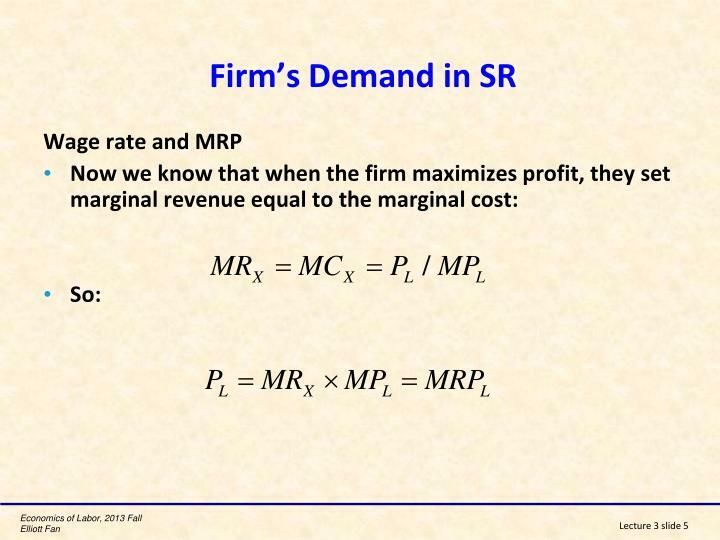 Assume fixed technology (the production function), rental rate (PK), and market price (PX). 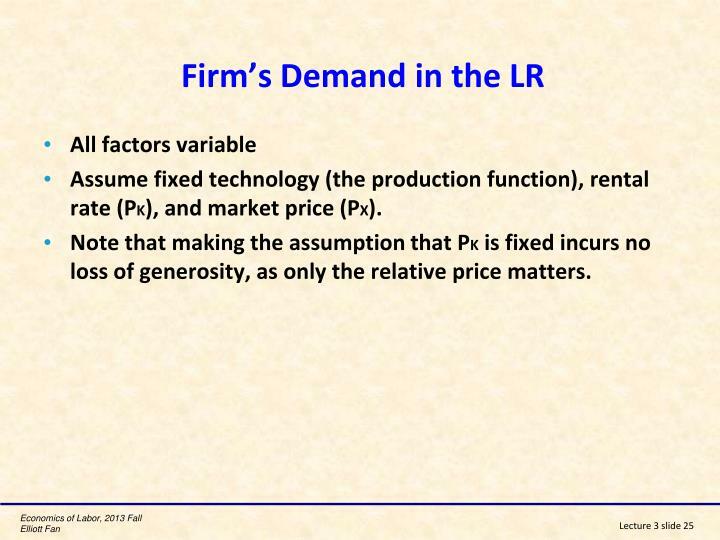 Note that making the assumption that PKis fixed incurs no loss of generosity, as only the relative price matters. 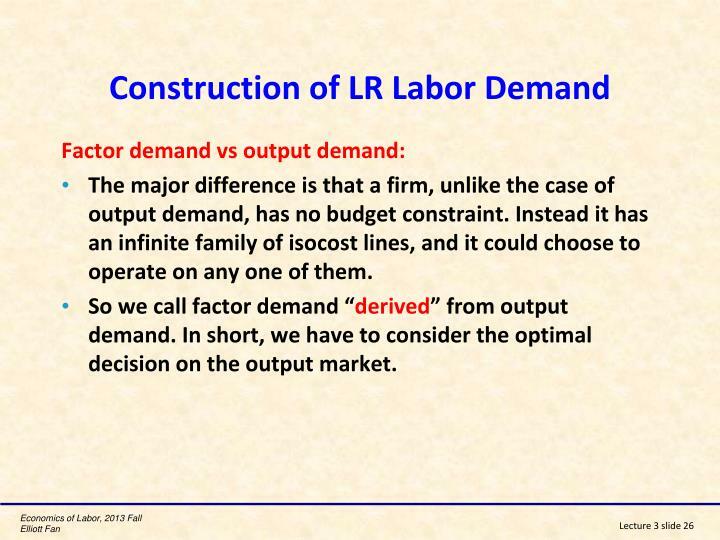 The major difference is that a firm, unlike the case of output demand, has no budget constraint. 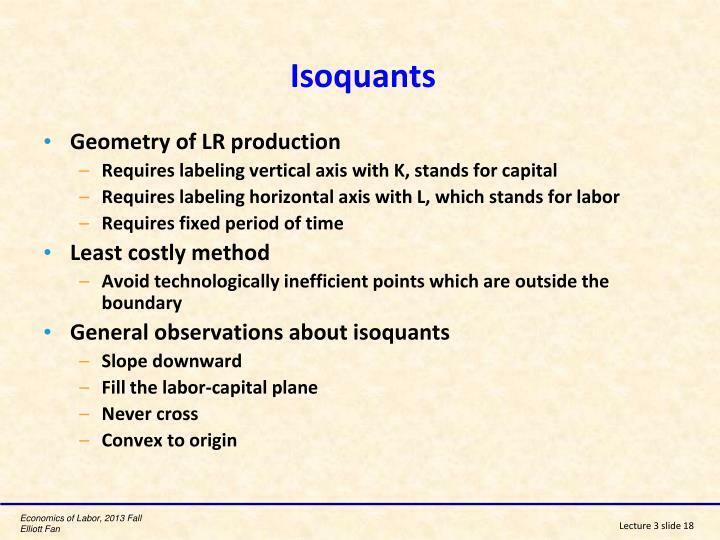 Instead it has an infinite family of isocost lines, and it could choose to operate on any one of them. 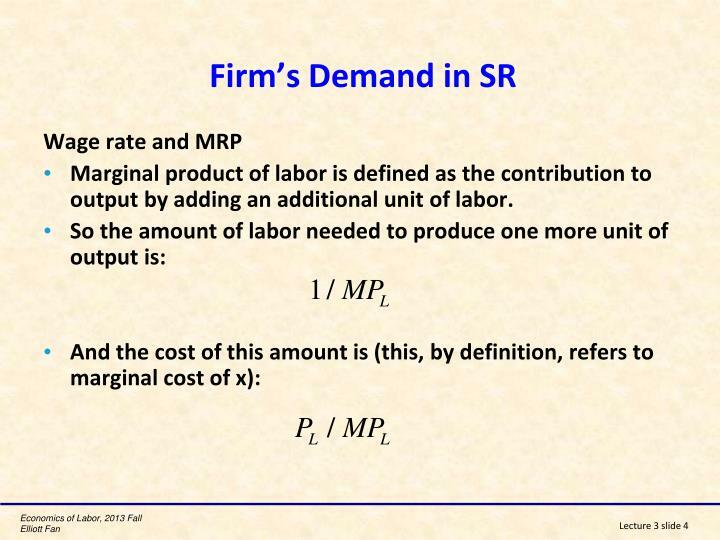 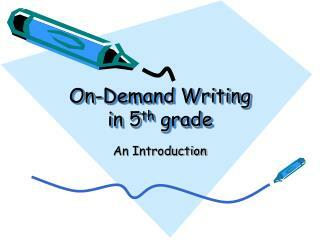 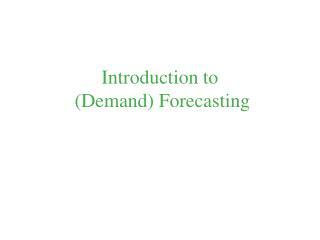 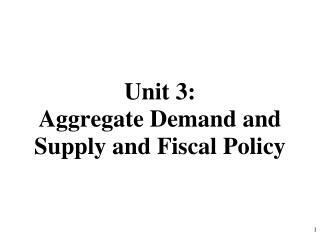 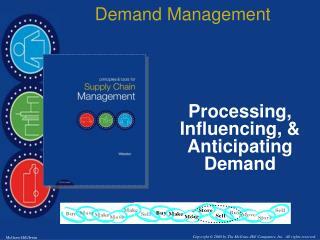 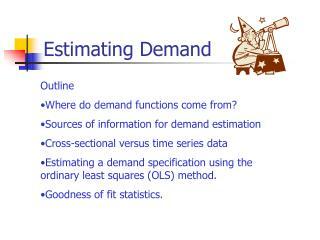 So we call factor demand “derived” from output demand. In short, we have to consider the optimal decision on the output market. 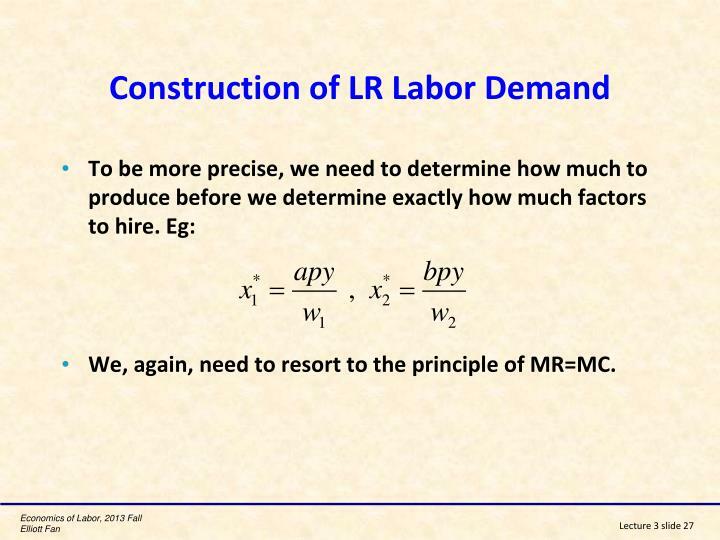 We, again, need to resort to the principle of MR=MC. 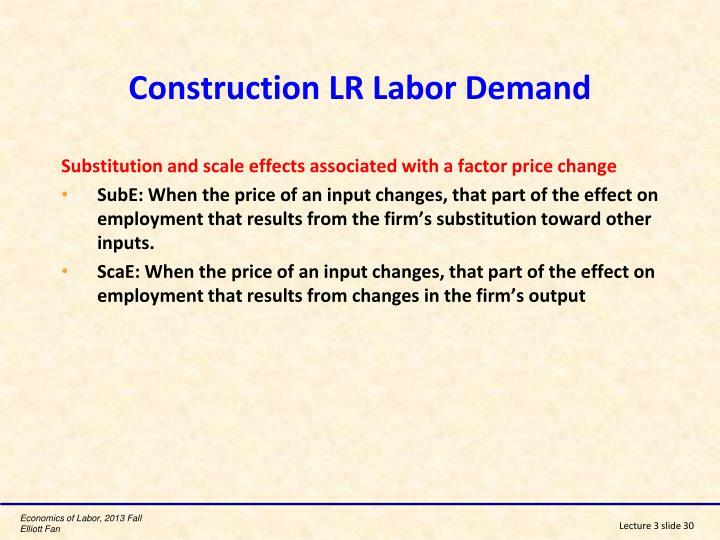 SubE: When the price of an input changes, that part of the effect on employment that results from the firm’s substitution toward other inputs. 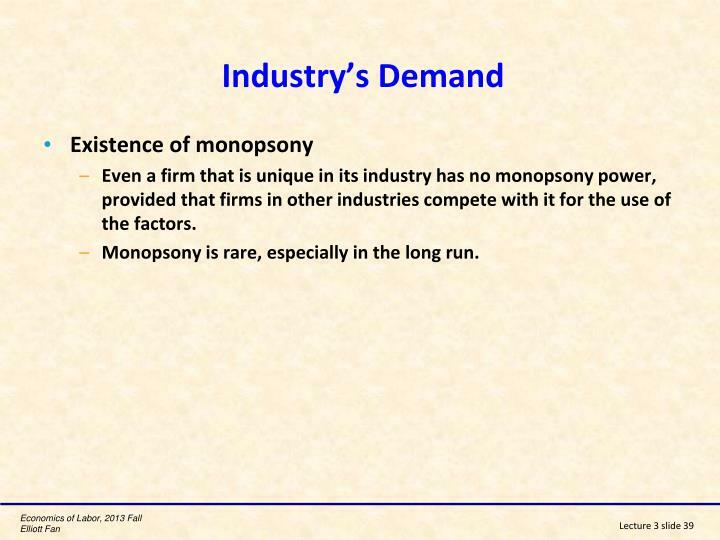 Even a firm that is unique in its industry has no monopsony power, provided that firms in other industries compete with it for the use of the factors. 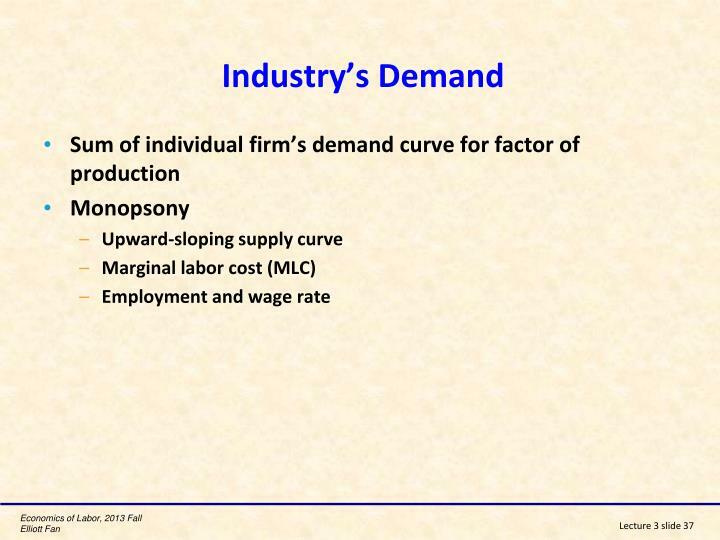 Monopsony is rare, especially in the long run. 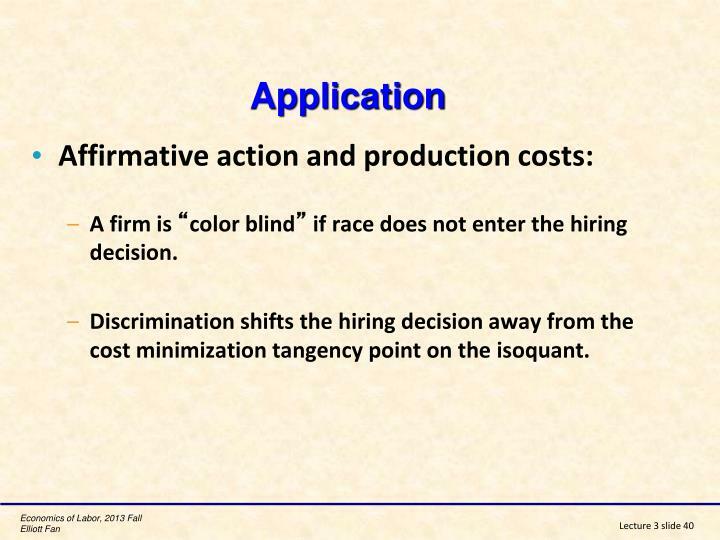 A firm is “color blind” if race does not enter the hiring decision. 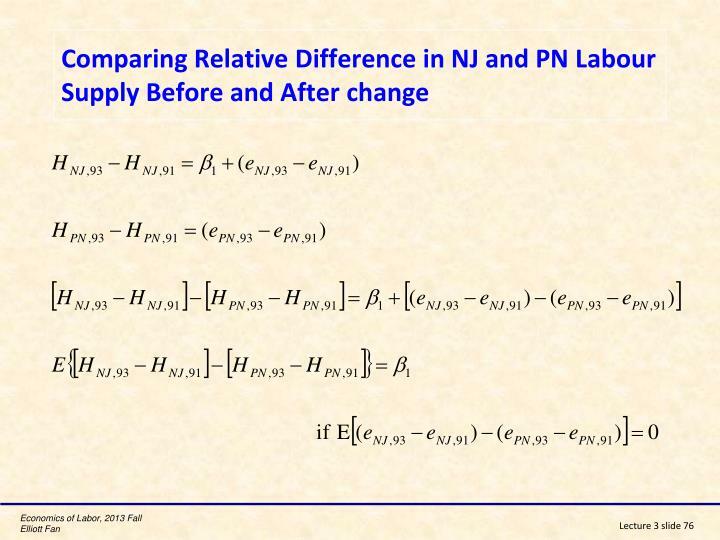 Discrimination shifts the hiring decision away from the cost minimization tangency point on the isoquant. 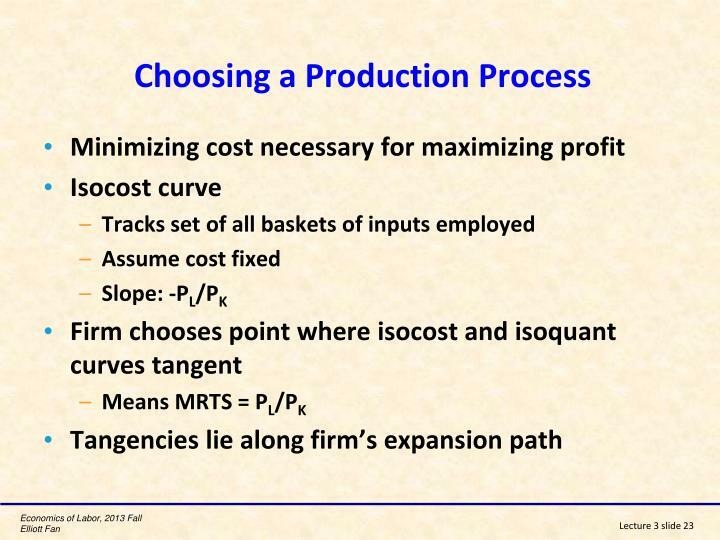 The discriminatory firm chooses the input mix at point P, ignoring the cost-minimizing rule that the isoquant be tangent to the isocost. 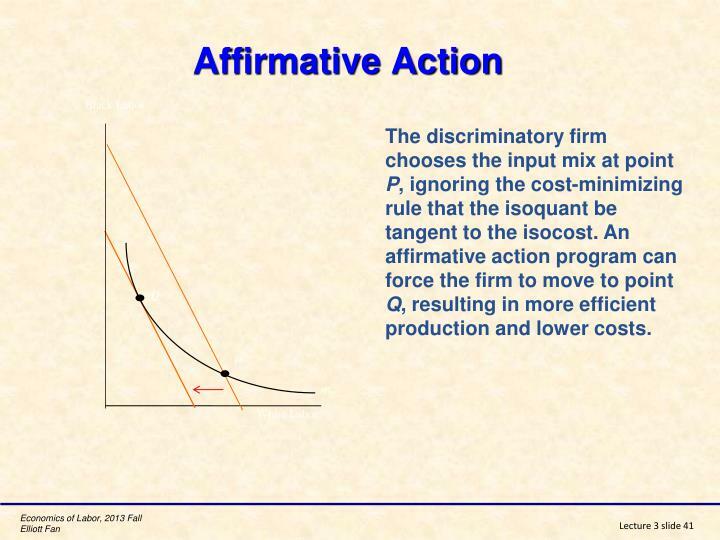 An affirmative action program can force the firm to move to point Q, resulting in more efficient production and lower costs. 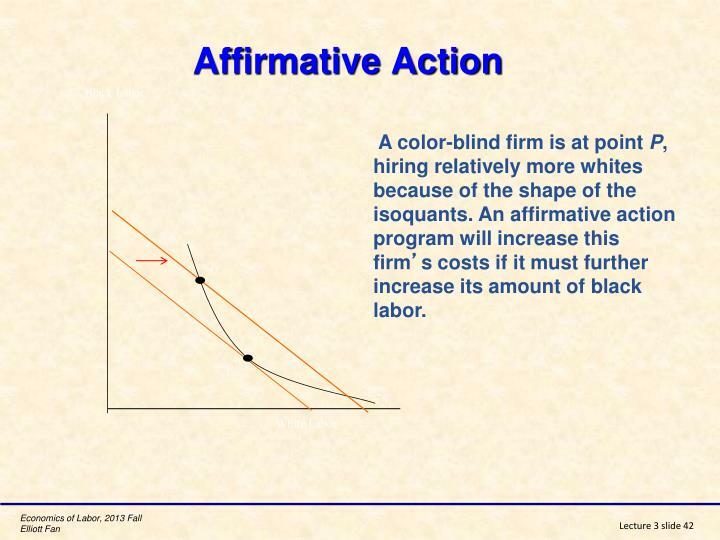 A color-blind firm is at point P, hiring relatively more whites because of the shape of the isoquants. 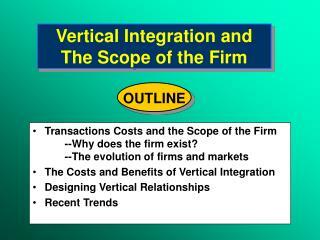 An affirmative action program will increase this firm’s costs if it must further increase its amount of black labor. 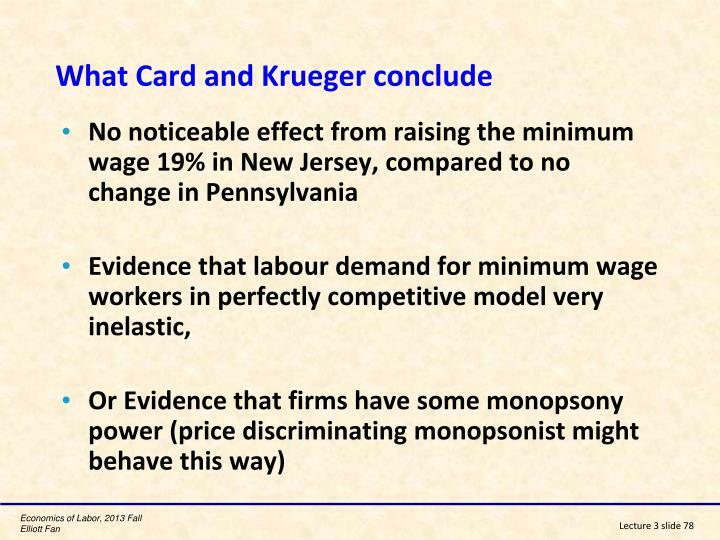 Do monopoly firms hire more or less? 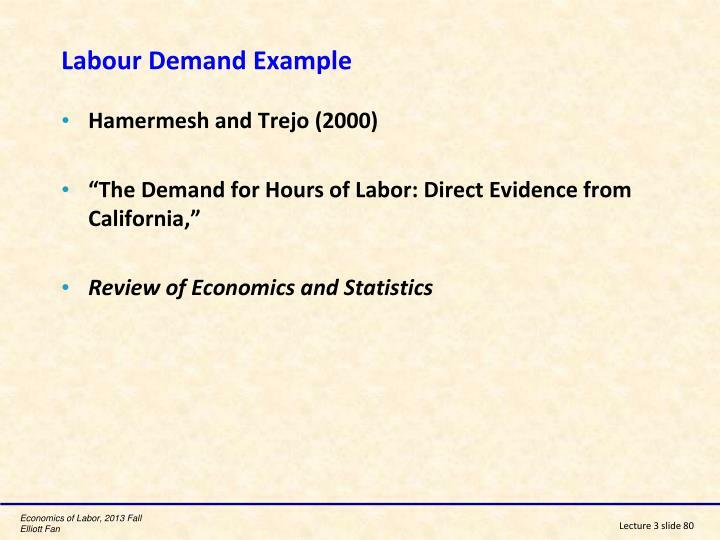 This implies that a monopoly’s labor demand lies below the one for an otherwise identical competitive firm. 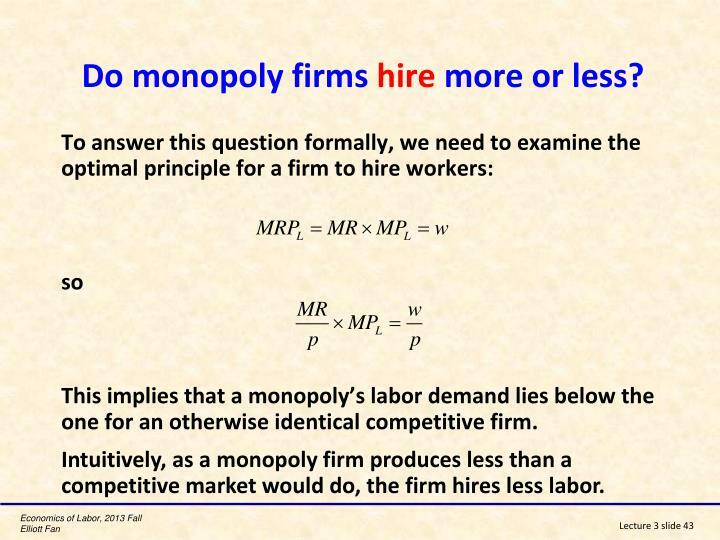 Intuitively, as a monopoly firm produces less than a competitive market would do, the firm hires less labor. 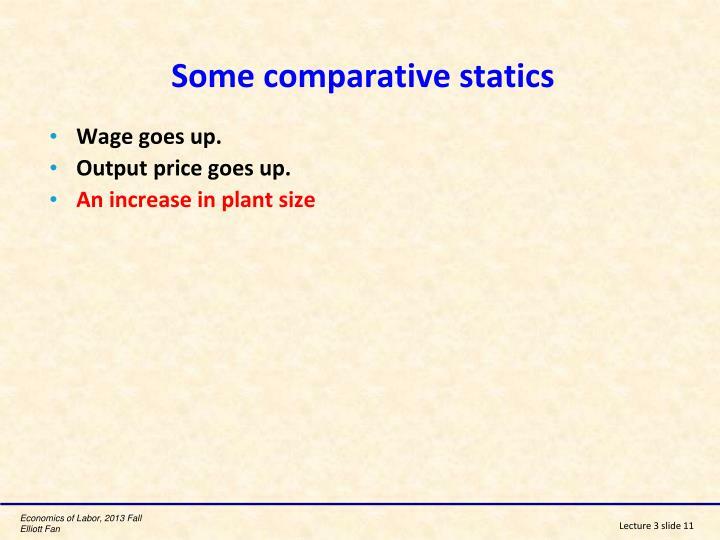 Do monopoly firms pay more or less? 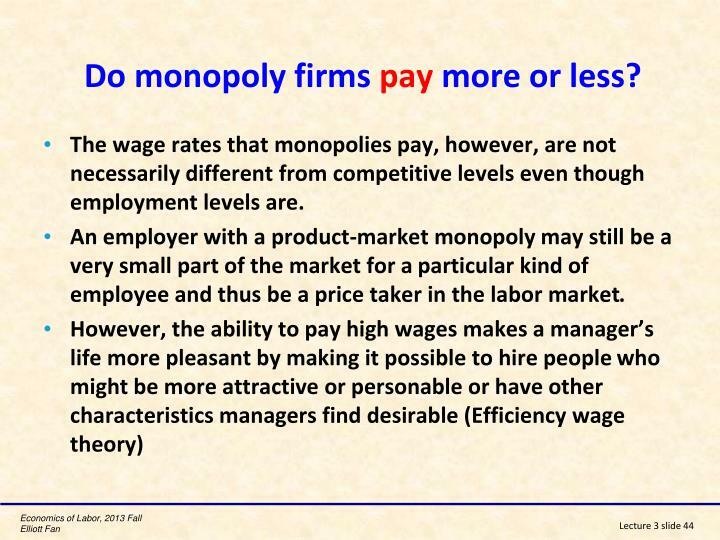 The wage rates that monopolies pay, however, are not necessarily different from competitive levels even though employment levels are. 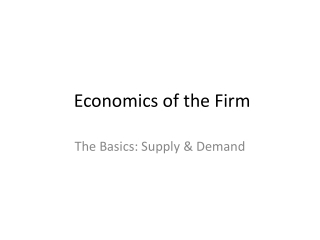 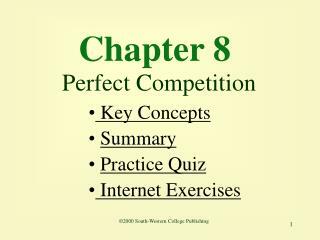 An employer with a product-market monopoly may still be a very small part of the market for a particular kind of employee and thus be a price taker in the labor market. 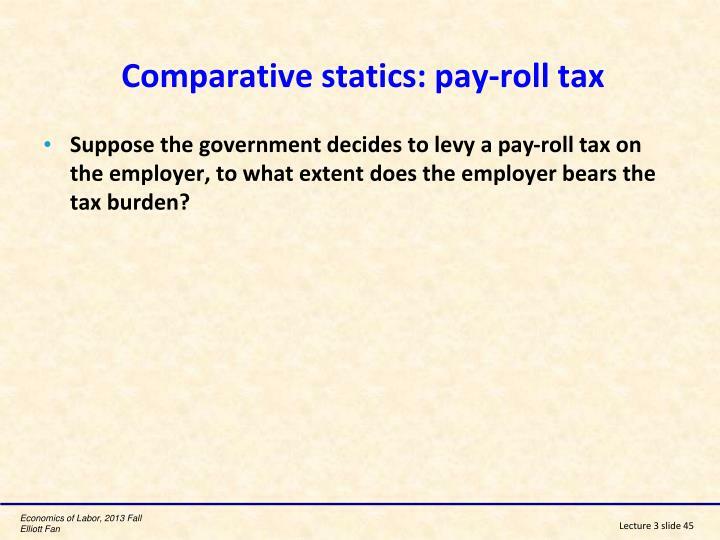 Suppose the government decides to levy a pay-roll tax on the employer, to what extent does the employer bears the tax burden? 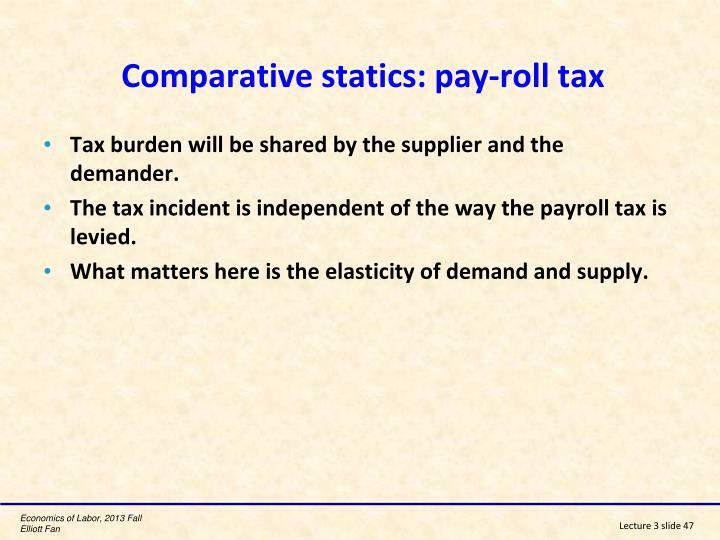 Tax burden will be shared by the supplier and the demander. 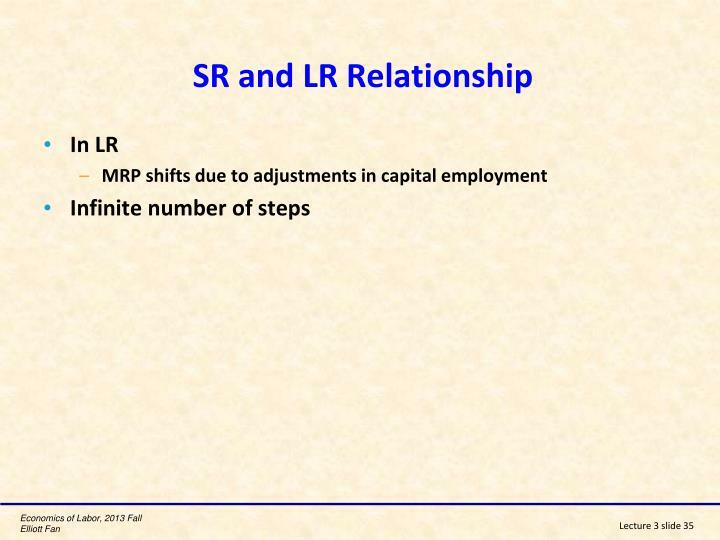 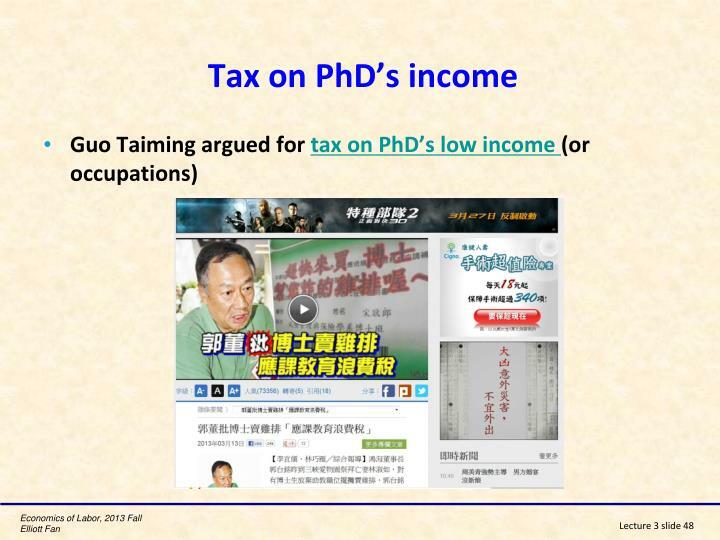 The tax incident is independent of the way the payroll tax is levied. 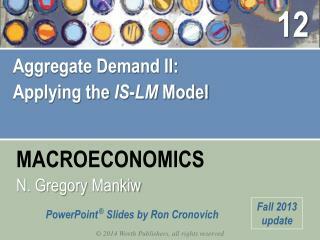 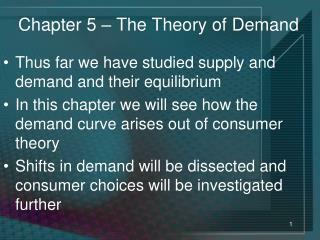 What matters here is the elasticity of demand and supply. 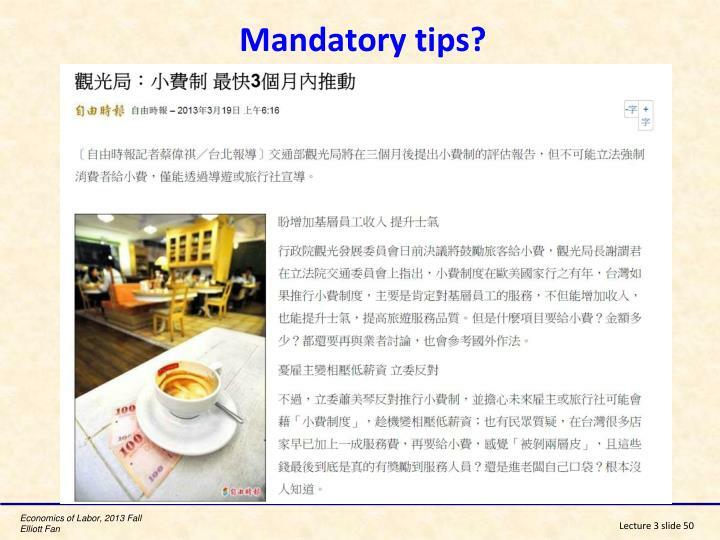 There is no way to implement it successfully. 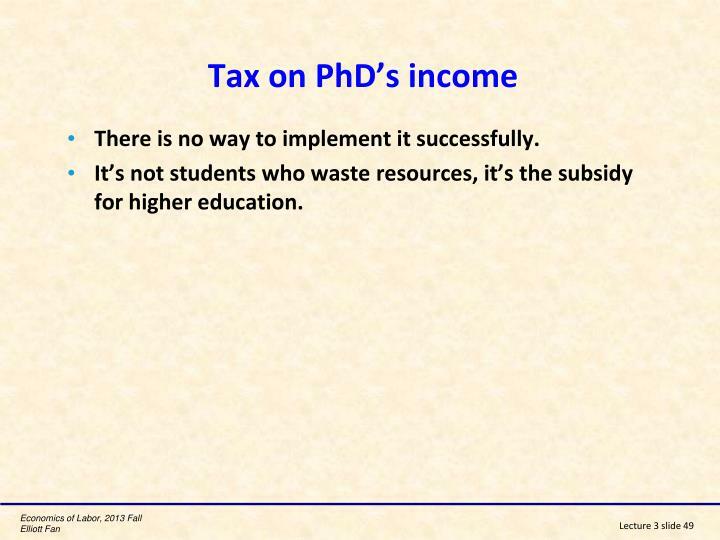 It’s not students who waste resources, it’s the subsidy for higher education. 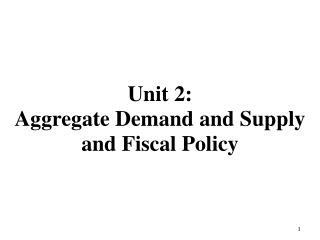 AGAIN, There is no way to implement it successfully due to non-compliance. 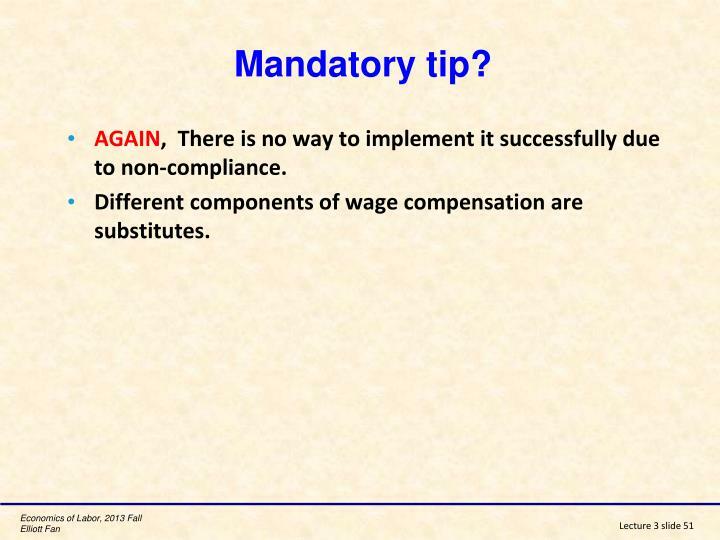 Different components of wage compensation are substitutes. 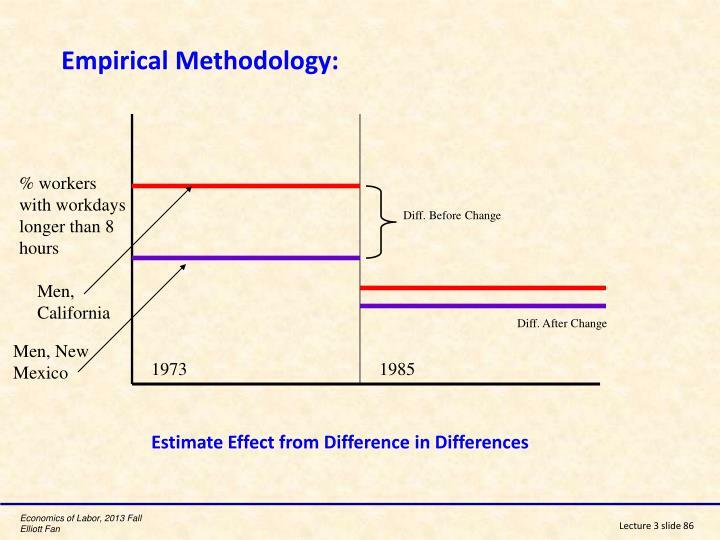 Using percent change, instead of level change, to avoid the effect of measurement unit. 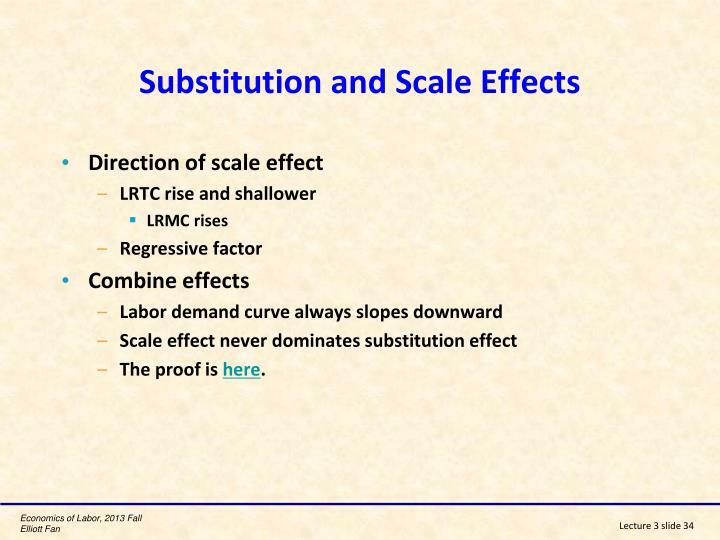 We usually pay attention only to the magnitude, as the sign is assumed to be negative. 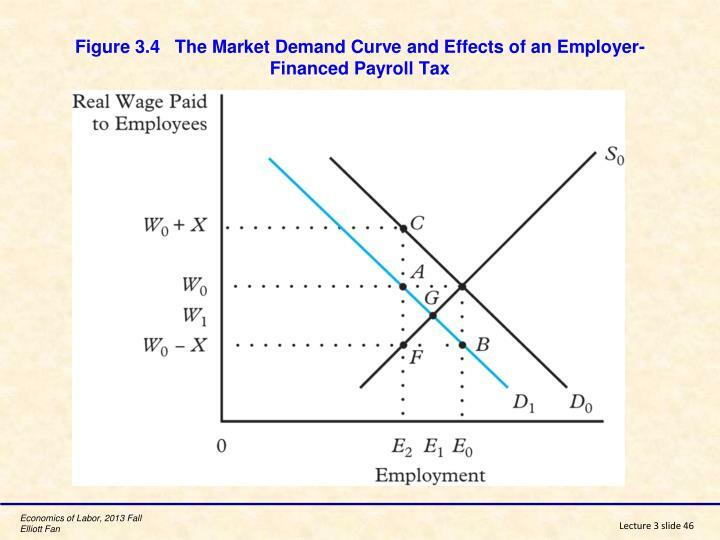 Note that it is a measure for a point, not for the entire curve. 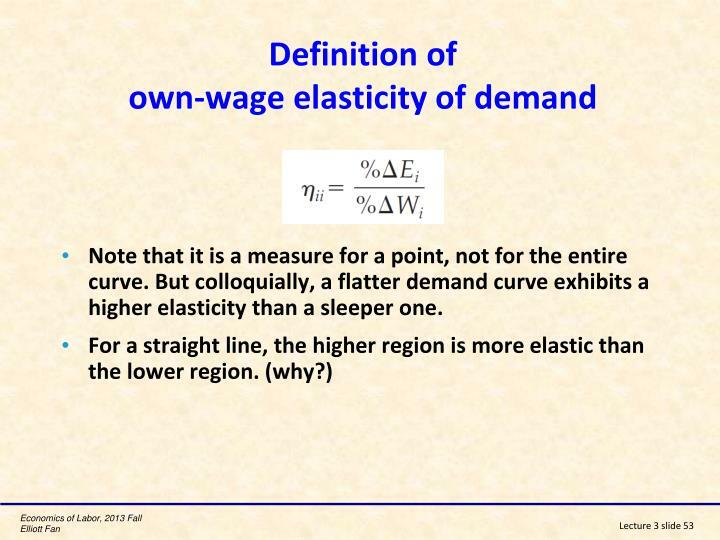 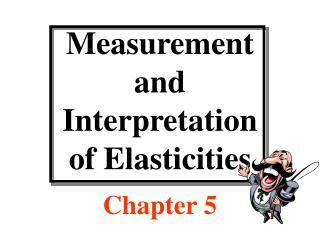 But colloquially, a flatter demand curve exhibits a higher elasticity than a sleeper one. 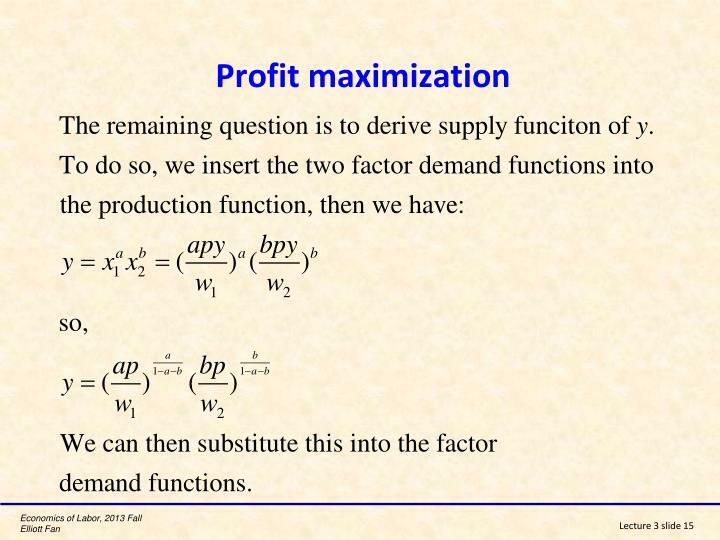 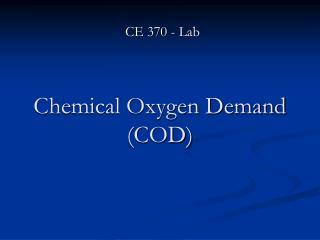 When the price elasticity of demand for the product being produced is high. 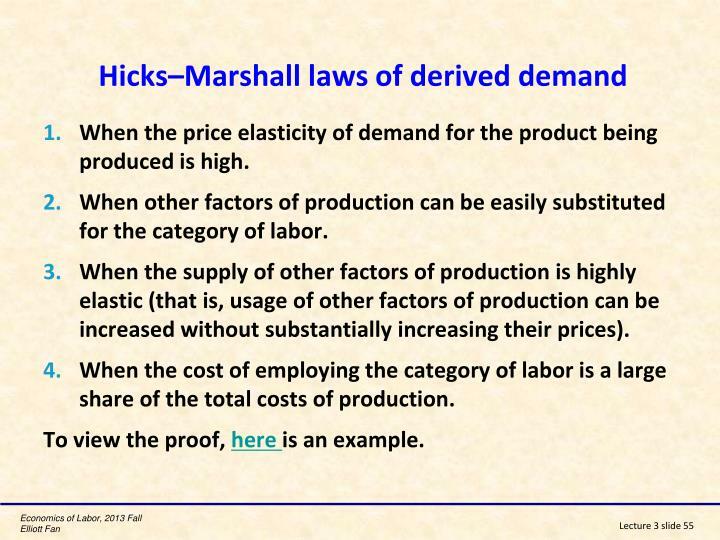 When other factors of production can be easily substituted for the category of labor. 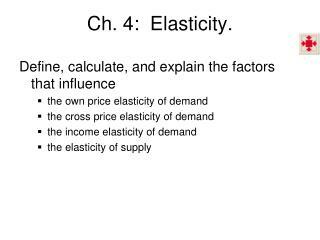 When the supply of other factors of production is highly elastic (that is, usage of other factors of production can be increased without substantially increasing their prices). When the cost of employing the category of labor is a large share of the total costs of production. 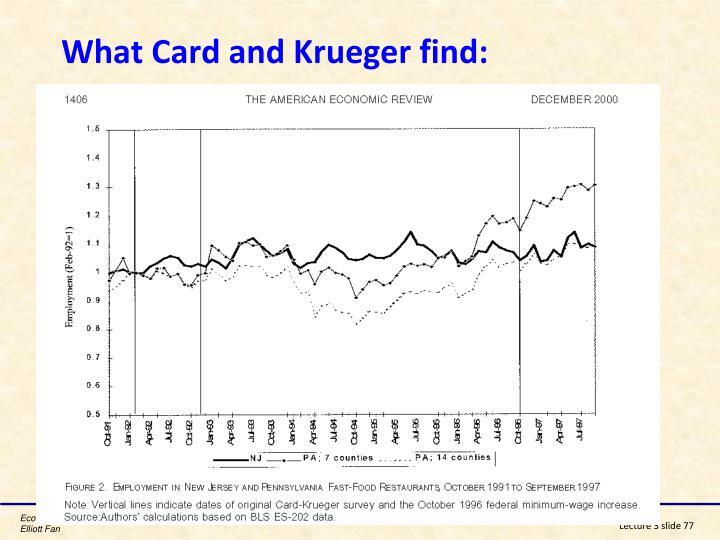 To view the proof, here is an example. 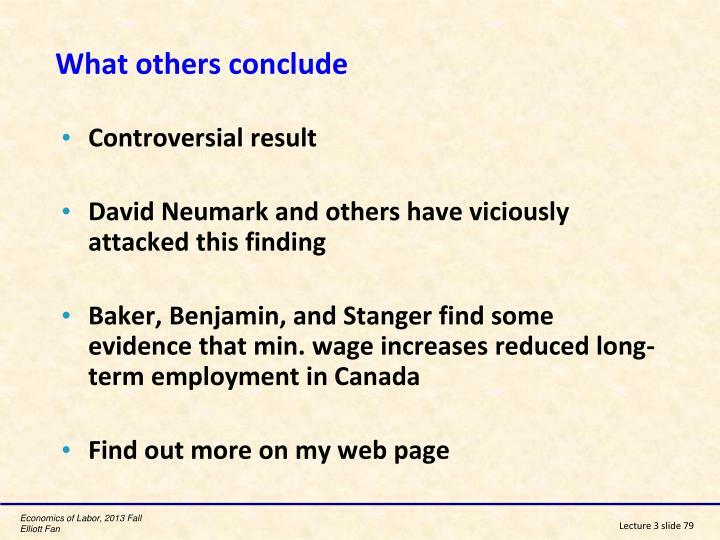 Most unions value both wage and employment opportunities for their members. 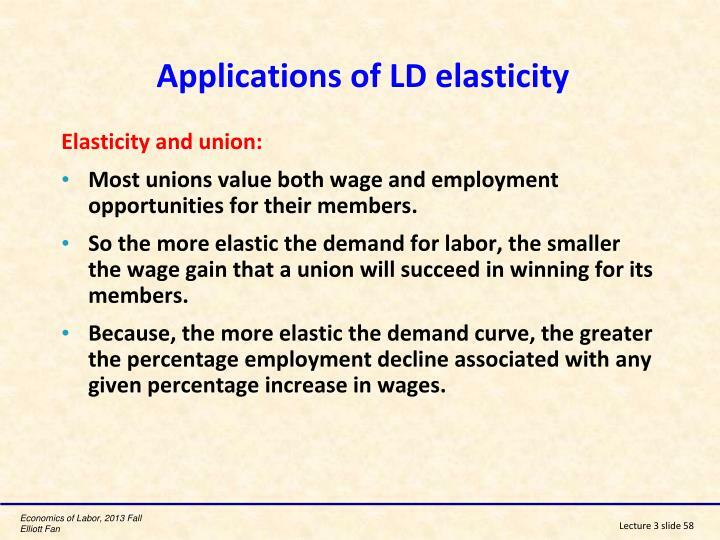 So the more elastic the demand for labor, the smaller the wage gain that a union will succeed in winning for its members. 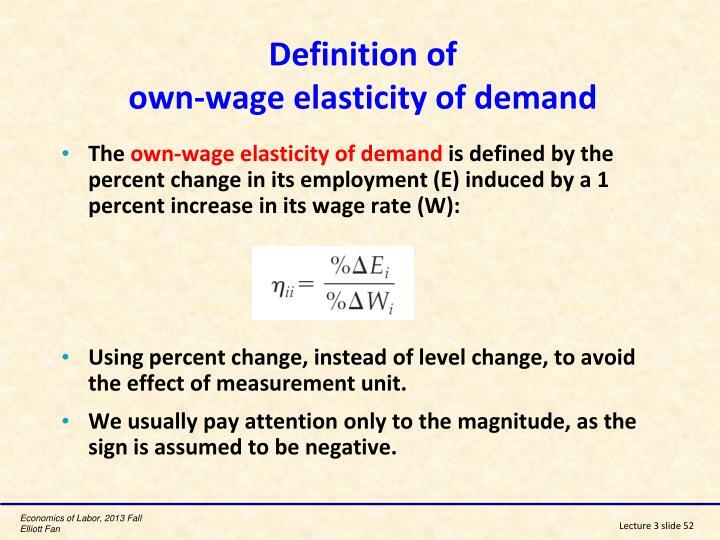 Because, the more elastic the demand curve, the greater the percentage employment decline associated with any given percentage increase in wages. 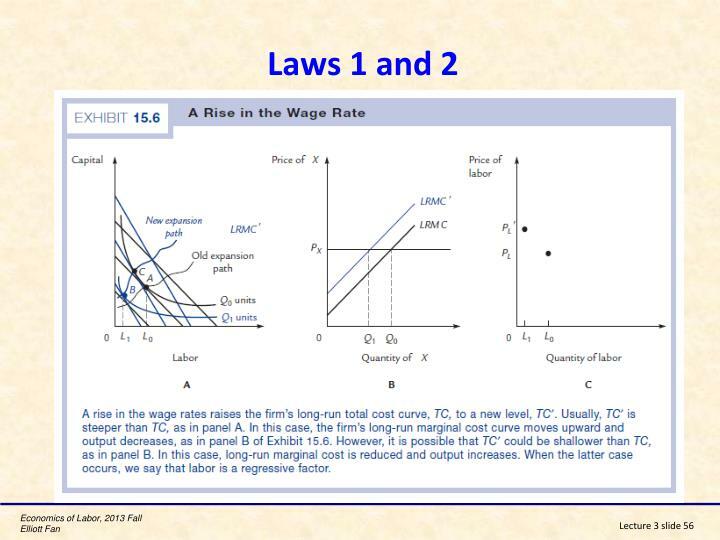 Unions would win larger wage gains for their members in markets with inelastic labor demand curves. 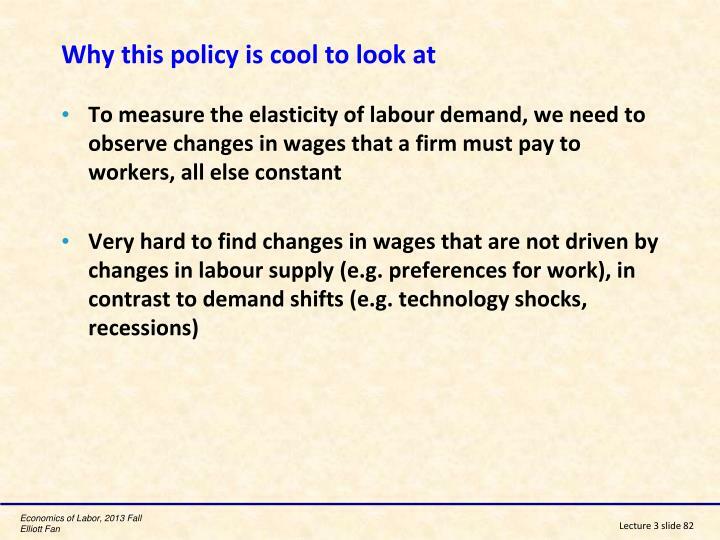 Unions would strive to take actions that reduce the wage elasticity of demand for their members’ services. 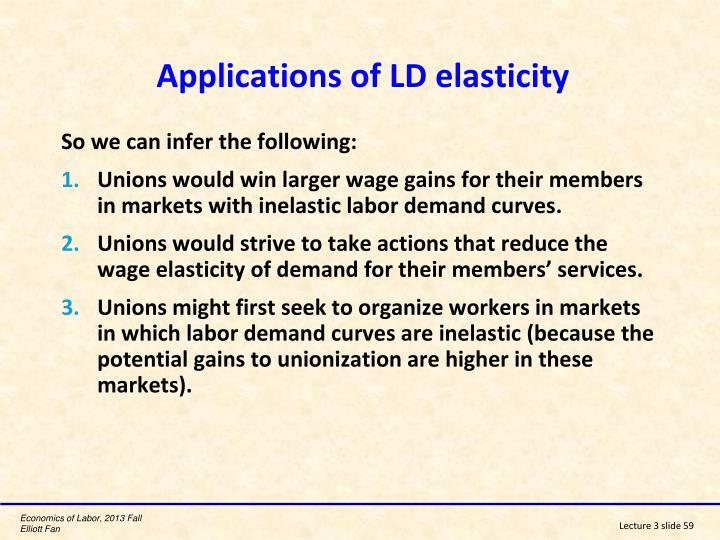 Unions might first seek to organize workers in markets in which labor demand curves are inelastic (because the potential gains to unionization are higher in these markets). 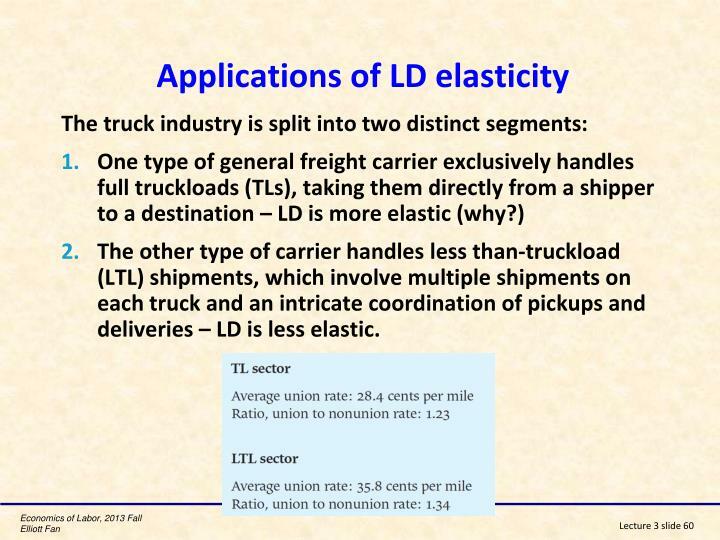 The other type of carrier handles less than-truckload (LTL) shipments, which involve multiple shipments on each truck and an intricate coordination of pickups and deliveries – LD is less elastic. 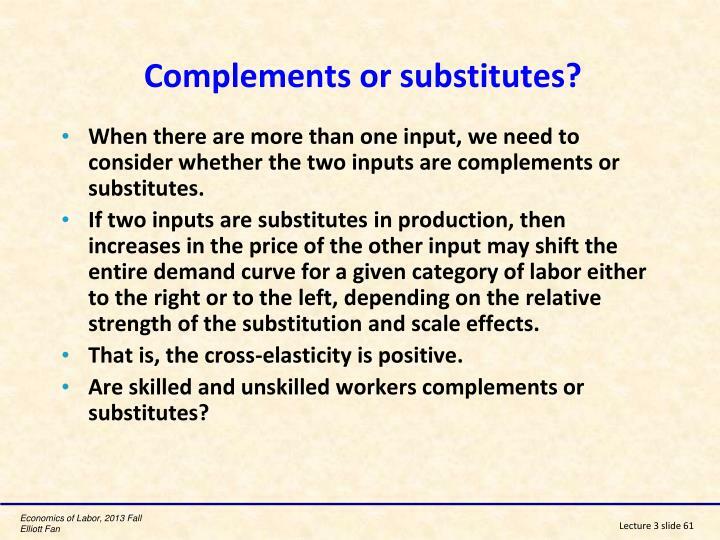 When there are more than one input, we need to consider whether the two inputs are complements or substitutes. 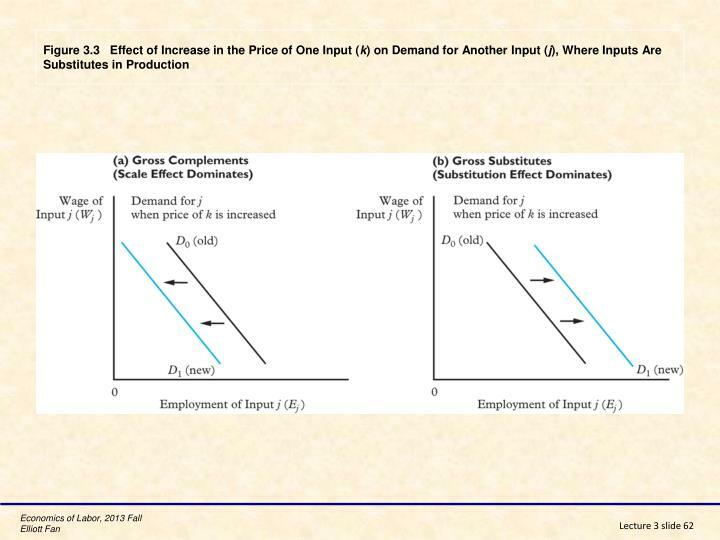 If two inputs are substitutes in production, then increases in the price of the other input may shift the entire demand curve for a given category of labor either to the right or to the left, depending on the relative strength of the substitution and scale effects. 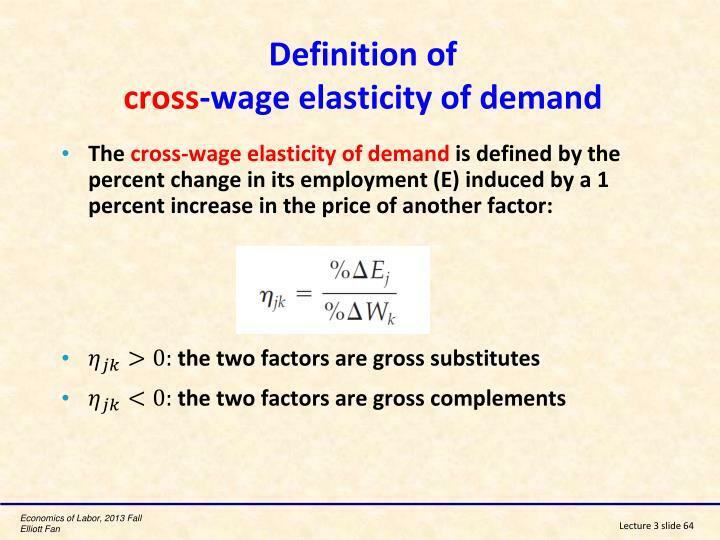 That is, the cross-elasticity is positive. 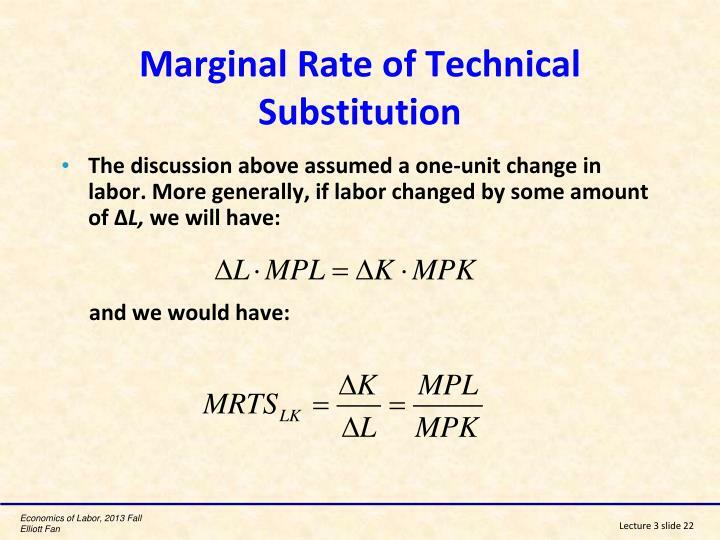 Are skilled and unskilled workers complements or substitutes? 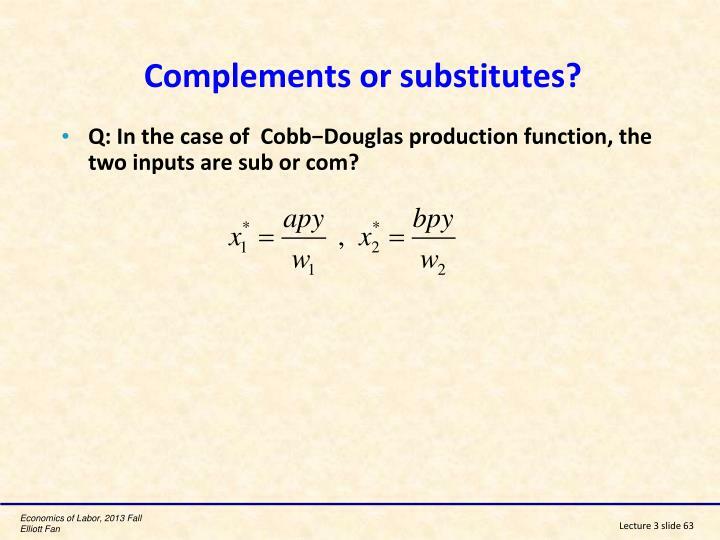 Q: In the case of are sub or com? 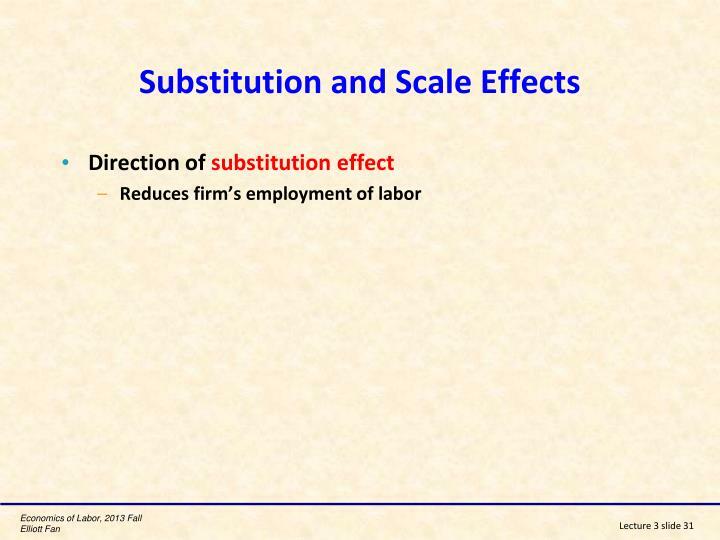 There is a substitution effect: for a given level of output, employers will now have an incentive to substitute teens for adults in the production process and reduce adult employment. 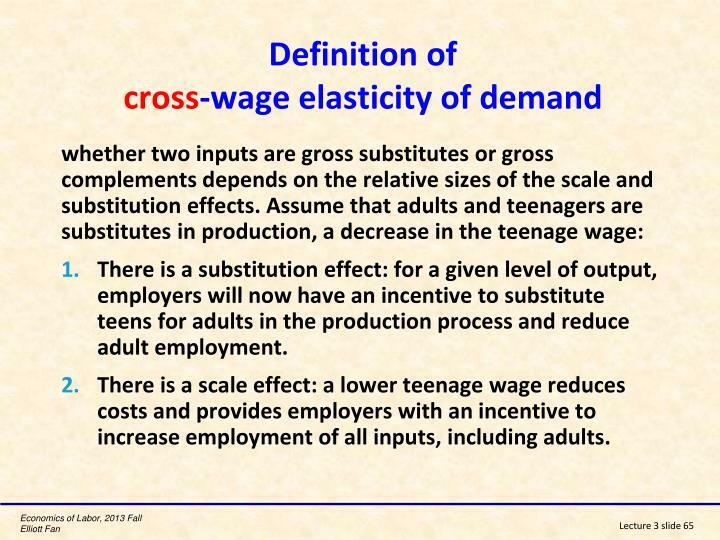 There is a scale effect: a lower teenage wage reduces costs and provides employers with an incentive to increase employment of all inputs, including adults. 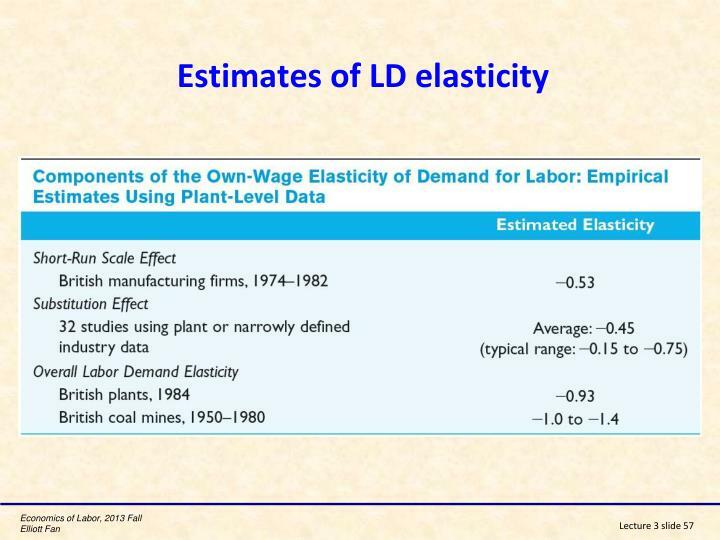 Skilled labor and unskilled labor are substitutes in production. 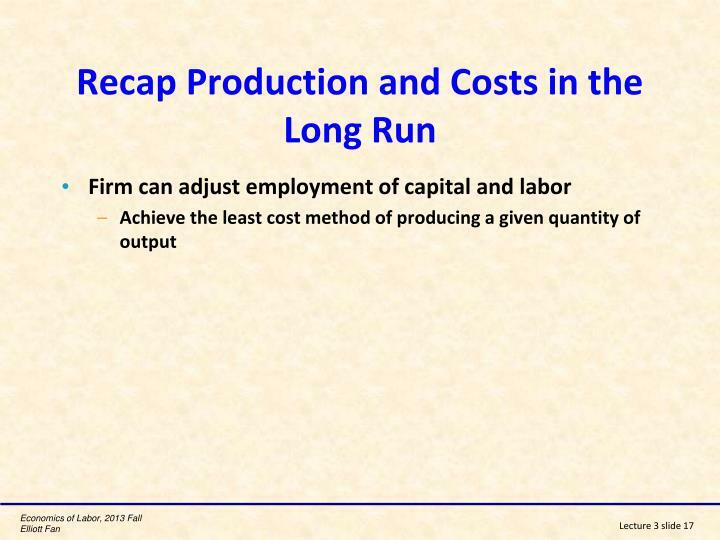 We are not certain whether either skilled or unskilled labor is a substitute for or a complement with capital in the production process. 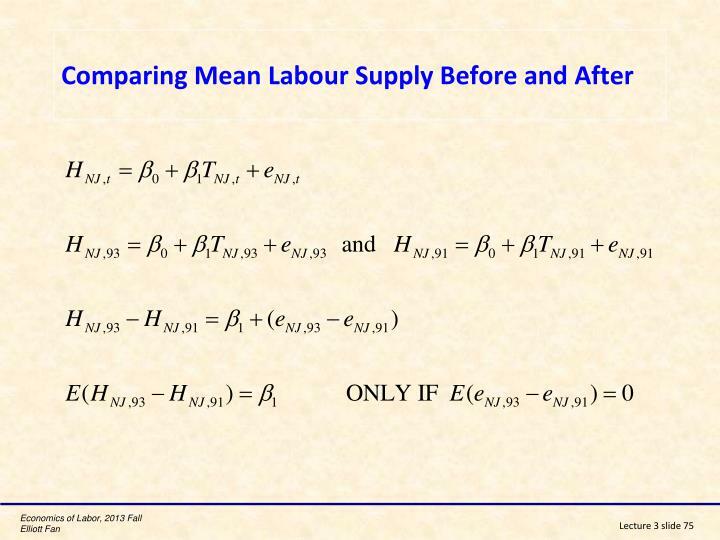 What does appear to be true is that skilled (or well-educated) labor is more likely to be complementary with capital than is unskilled labor—and that if they are both substitutes for capital, the degree of substitutability is smaller for skilled labor. 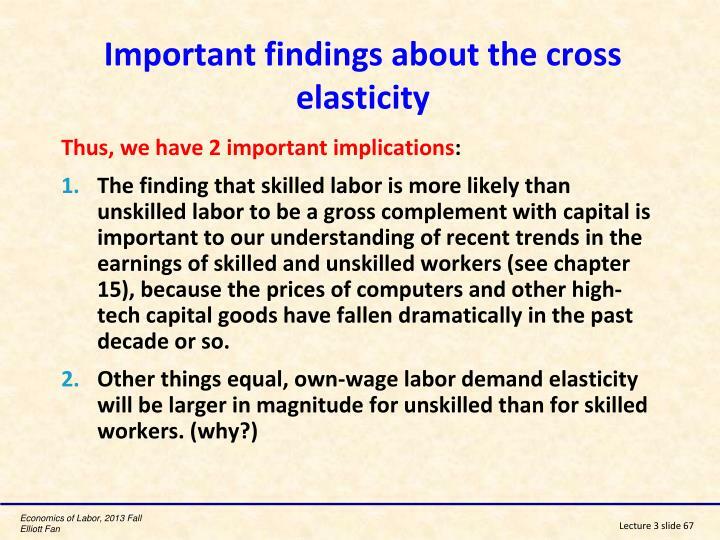 The finding that skilled labor is more likely than unskilled labor to be a gross complement with capital is important to our understanding of recent trends in the earnings of skilled and unskilled workers (see chapter 15), because the prices of computers and other high-tech capital goods have fallen dramatically in the past decade or so. 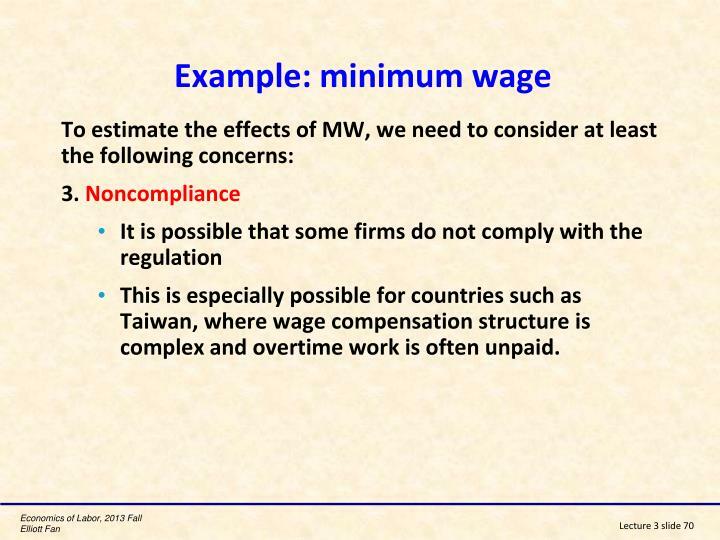 This is especially possible for countries such as Taiwan, where wage compensation structure is complex and overtime work is often unpaid. 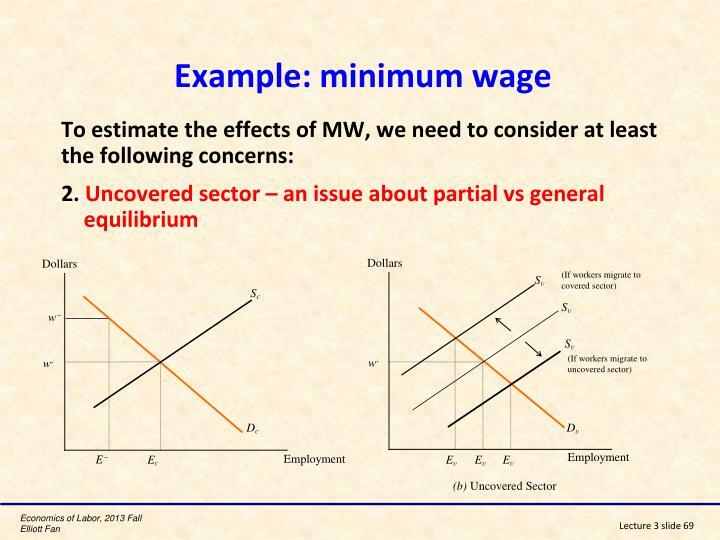 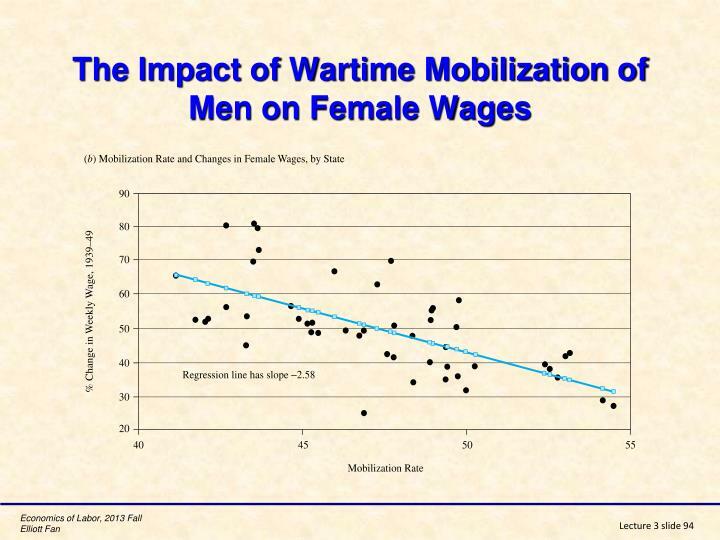 The effect of MW on confronting poverty is also limited. 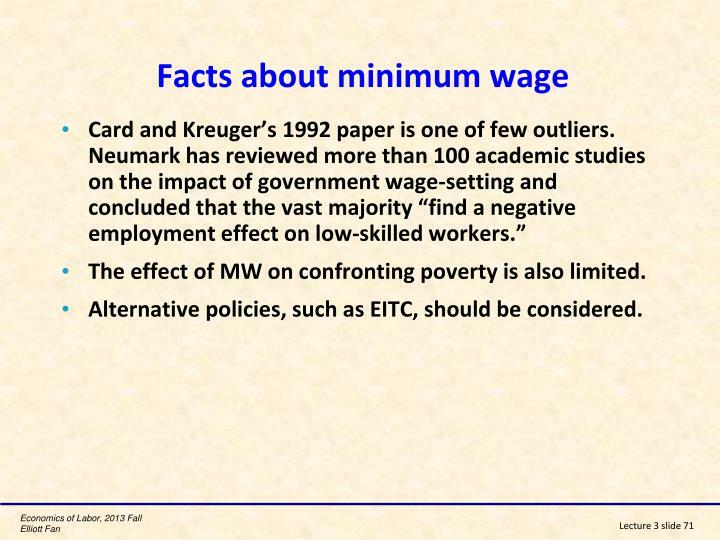 Alternative policies, such as EITC, should be considered. 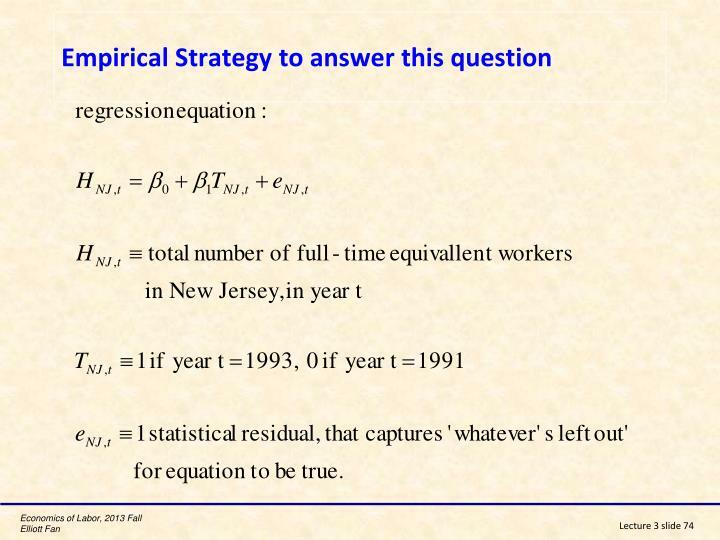 In 1992, New Jersey raised the min. 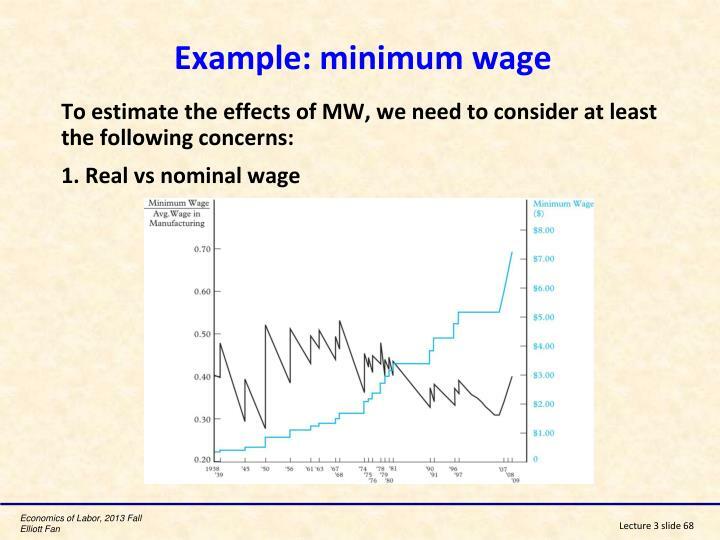 wage from $4.25 to $5.05 largest min. 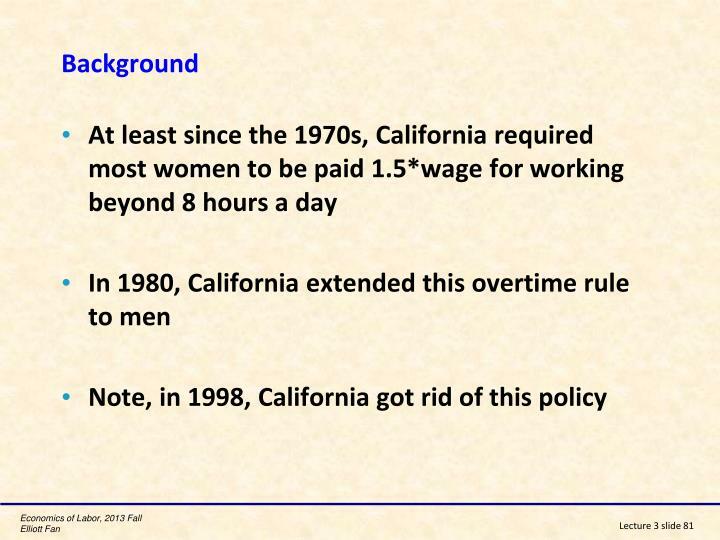 wage in the United States at that time. 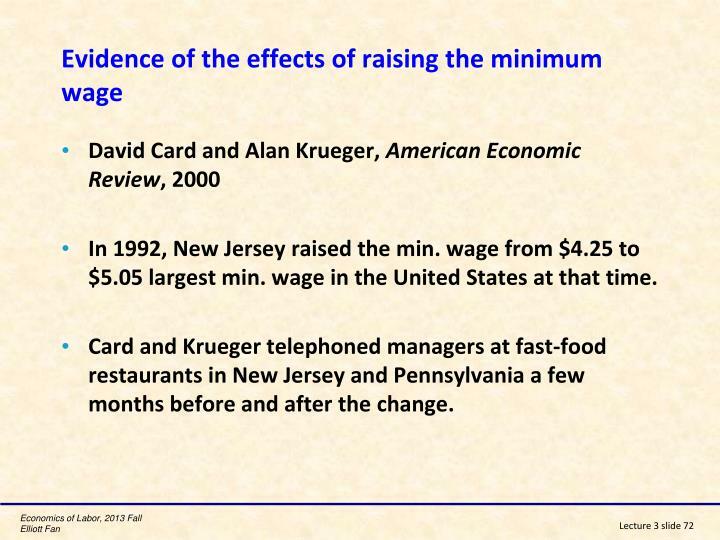 Card and Krueger telephoned managers at fast-food restaurants in New Jersey and Pennsylvania a few months before and after the change. 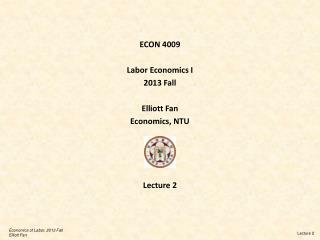 Question: Did the min. 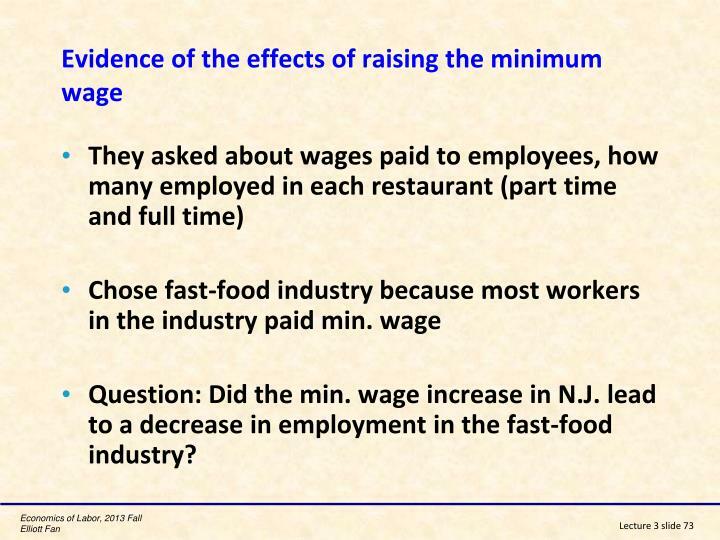 wage increase in N.J. lead to a decrease in employment in the fast-food industry? 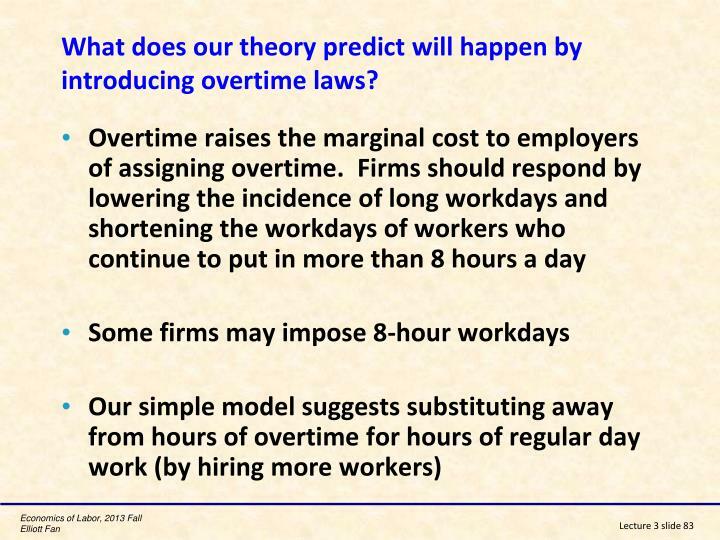 What does our theory predict will happen by introducing overtime laws? 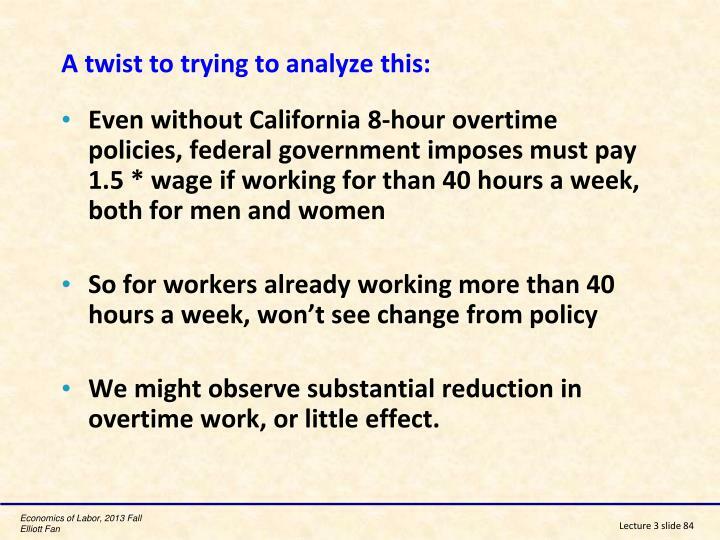 We might observe substantial reduction in overtime work, or little effect. 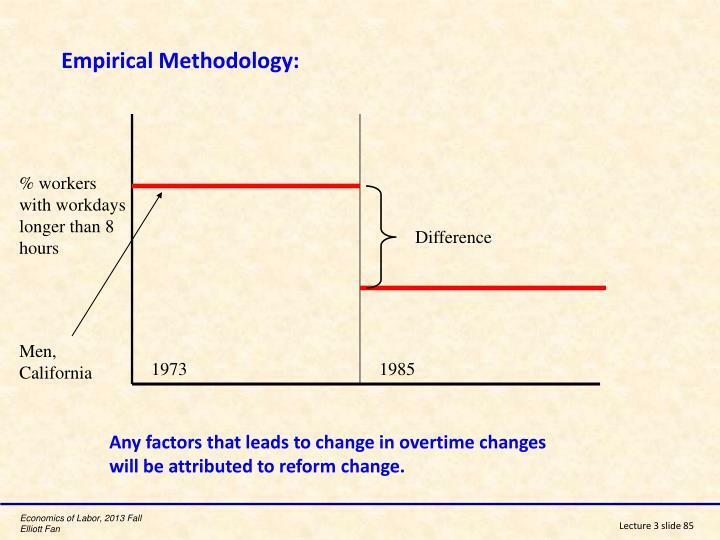 Any factors that leads to change in overtime changes will be attributed to reform change. 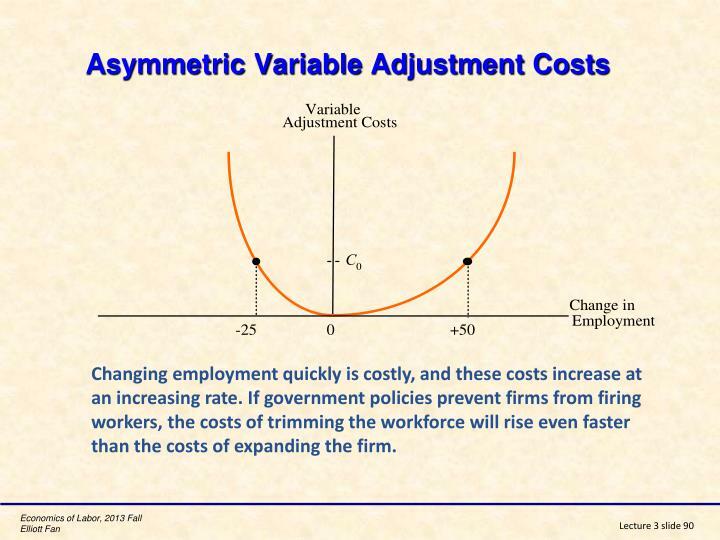 Changing employment quickly is costly, and these costs increase at an increasing rate. 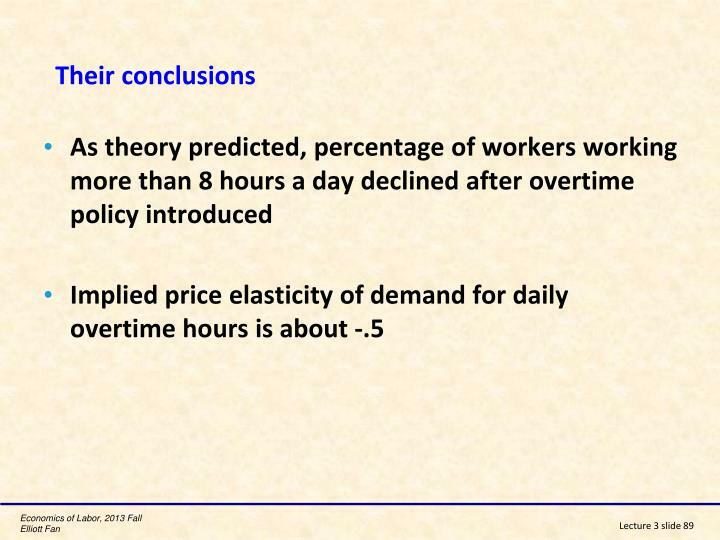 If government policies prevent firms from firing workers, the costs of trimming the workforce will rise even faster than the costs of expanding the firm. 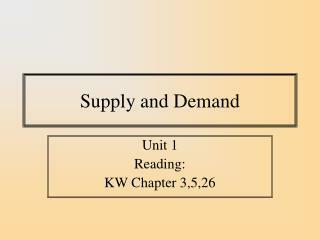 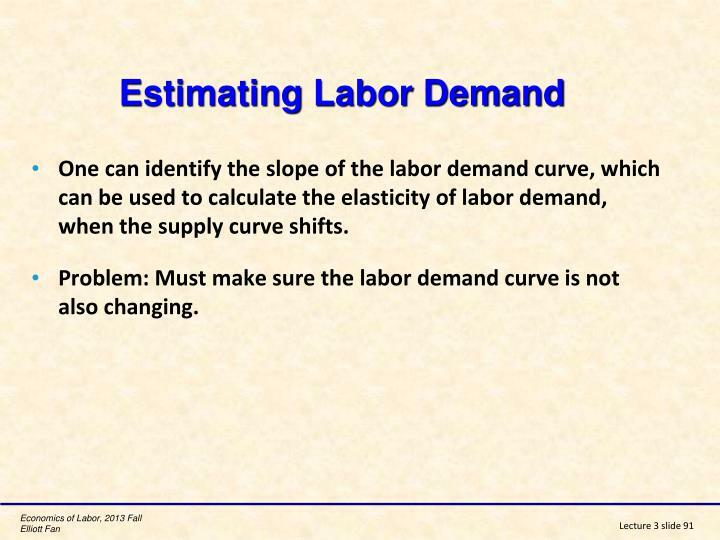 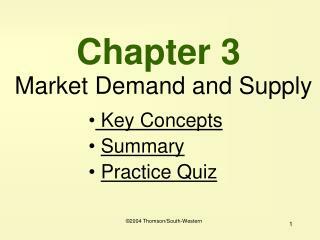 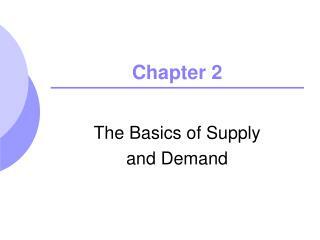 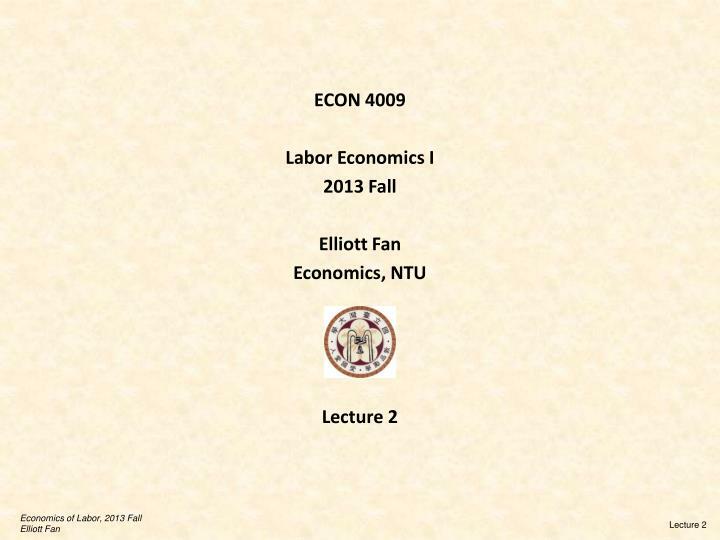 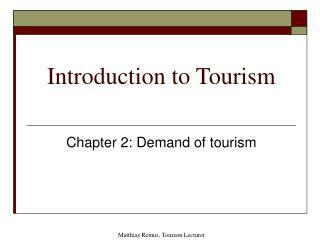 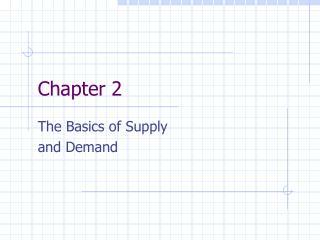 One can identify the slope of the labor demand curve, which can be used to calculate the elasticity of labor demand, when the supply curve shifts. 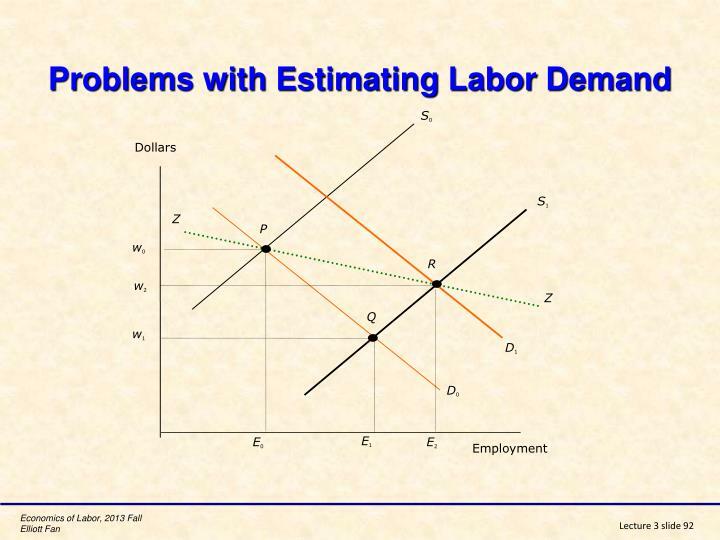 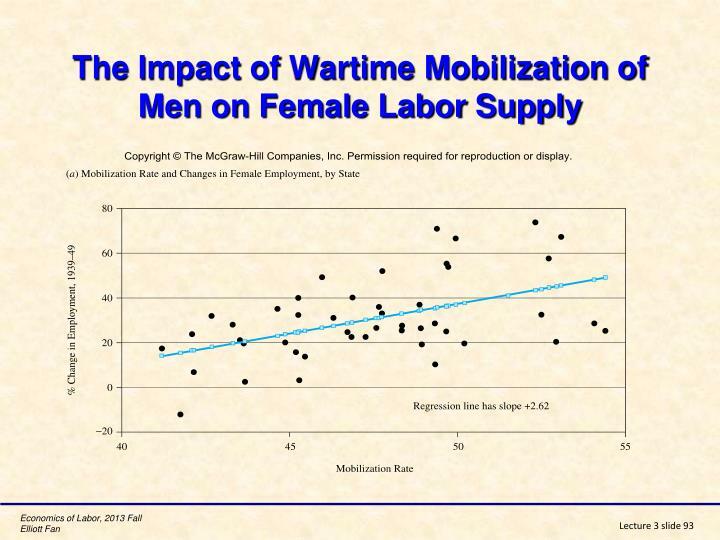 Problem: Must make sure the labor demand curve is not also changing.